So sorry for late post, but I had my nephews over and we had so much fun. It was fun week on Stardoll too, another week with 2 tribute releases, and some other stuff... you'll see. On Monday, Stardoll released Inspired by Dolce & Gabanna Tribute store. The pieces are unusual, which is usual thing for Tribute stores. Another release with high fashion items, while not as much as McQueen Tribute, still most items are not something you would wear on daily basis for ordinary events. Though there are pieces that can be worn as everyday clothes, or for some more formal events. Anyway, the collection is really pretty, though not much my style. On Wednesday, we got new Epiphany collection. The collection seems to be kind of Boho style (correct me if I'm wrong, I ain't much a fashion expert). We have a lot of gold tones, some 'fake' eyeshadows, which are great thing in my opinion and I want a store dedicated to them only as regular eyeshadow can sometimes be really hard to be put on properly. Prices are fair, but I rarely use jewelry that goes to beauty parlor, except for those fake eyeshadows. I would have preferred some chokers, as they seem to be really popular nowadays. 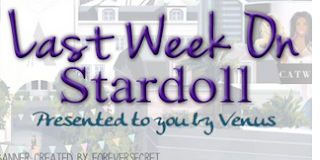 On Thursday, Stardoll announced that Fever store is leaving the plaza. This time, unfortunately, we did not get a sale, but still, it is nice of them to let us know the store is leaving as there were pieces I wanted to buy (and I bought in time). You still have some time to buy in case you missed anything, but don't wait too long. And on Friday, we got new Tribute release - Inspired by Jimmy Choo Tribute. Obviously, this store consists of shoes only. (Well, there is a nice shoe box, and the interior is amazing.) The designer is quite famous name in shoe design industry, and the shoes we got are pretty amazing. I really love buying shoes on Stardoll, and I plan buying many pairs, but I will probably wait a while (too much to buy, too little stardollars :(). My favorite are definitely black heels with silver on front. Like I said, interior is the best one we had in a while, at least for collectors. And that is it! Are you ready for MSW? Because, according to latest post, it is coming.. well, not that soon, but you will still have enough time to save up money in case you decide to try to run. I am really curious of what the prizes will be for the winner. Anyway, vote, comment, and see you next week.